Nothing wrong but you feel like opening them up anyway? 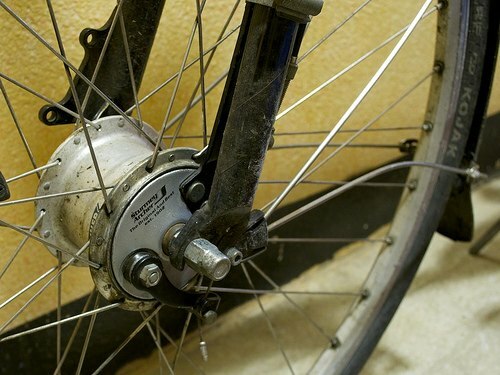 After a year commuting ten miles a day, I couldn’t help but feel that the Sturmey Archer X-FDD (click for in-depth review) drum brake on the front of my new utility bike must be in need of a routine service. A little over 2,000 miles and wearing in nicely! 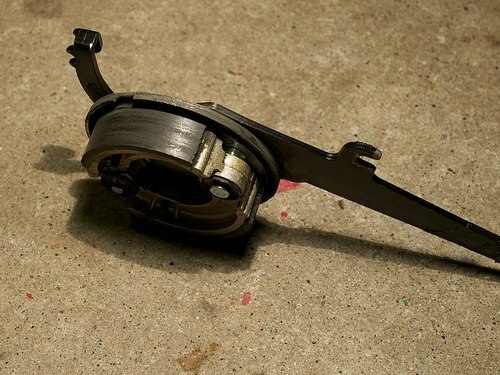 Fortunately, if you don’t need to replace the brake shoes (which have a really long lifespan – probably longer than most people keep a hub), opening and servicing Sturmey Archer drum brakes is a piece of cake. 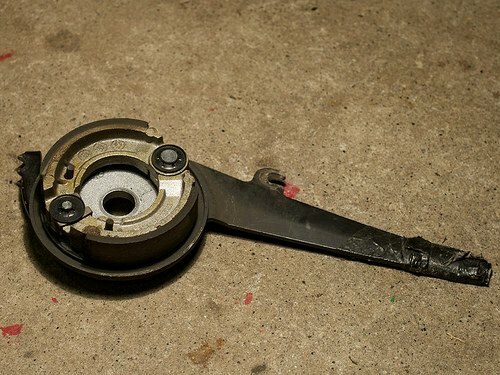 You only need to worry about the brake-side nut, and all that does is free up the brake plate: you’re not changing the bearing preload for the hub or anything like that. It’s a 16mm single nut (so no need for a fancy narrow cone wrench) – remove it and the whole brake plate will lift up, allowing access. The photo above shows what’s left of the hub with the brake plate removed: you want to clean this of any debris especially focusing on the inner braking surface. 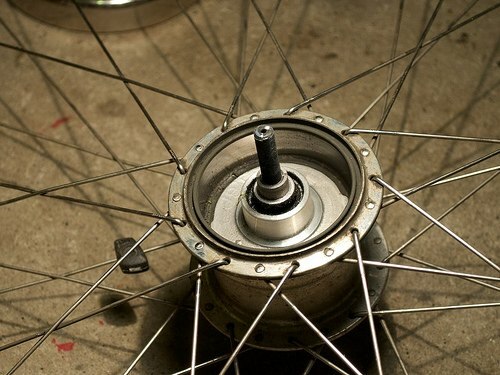 Don’t use just any old oily rag for this, unless you also like the feel of disc rotors or rim brakes covered in grease! (But don’t worry – you can’t contaminate the pads and ruin them, aka disc brake pads). Above you can see the back of the brake plate – there are two shoes, a fixed pivot point (on the right) and the cam ‘axle’ (on the left) which you’ll be able to see spreading the pads when you move the brake arm itself. Again, you want to generally clean this up. It’s commonly advised to put a *small* amount of lubrication on the axle and cam pivot points, but make sure not to leave any excess lubrication… I just dripped on a tiny amount of oil (which I had handy – rather than grease), worked the brake plate in my hand for a minute then carefully removed any visible traces… I like to be able to stop at the bottom of hills! And that’s it – pop the brake plate back on and do up the nut. In the case of the X-FDD or XL-FDD, don’t forget that you’ll want to turn the brake plate so that the reaction arm loosely lines up with the plug on the dynamo side (unless you’d like that to face the ground! The bits that do wear out, gradually, are the actuating cam’s thrust plates which fit over the ends of the brake shoes. When it’s time to replace the shoes themselves, keep the jam washers even if they break as you lever them off, because spares of that diameter are tricky to buy, and smaller ones won’t retain the shoes properly. But that won’t happen for about another 48,000 miles. do you know how to open the other side? In the winter somehow water and ice got into the hub and causes a cable break. I think it would be a simple work to fix it but I’m not able to open it, perhaps the wrong screwingdirection? 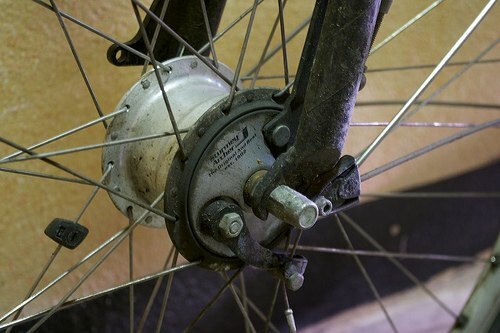 Do you feel that the heat from braking breaks down the hub grease on the bearings…? 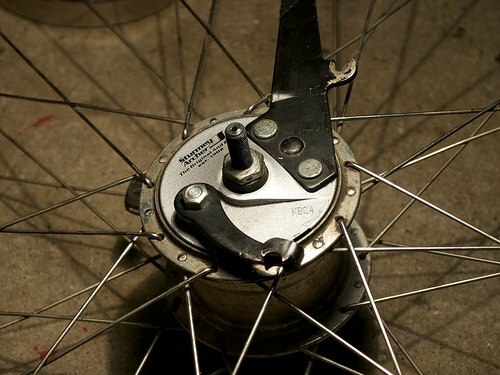 Shimano put so much effort into isolating their drum brakes from the hub, and adding heat sinks, tends to support what people often write on this subject. What do you see as an actual user…? The only problem I’ve found is that the return spring inside the hub can be overcome by winter crap, so basically when you apply the brake, it stays on. I “fixed” this by putting an external compression spring on the reaction arm (so braking compresses the spring, which then extends to keep the drum open normally. No grease / heat type problems, but then I wasn’t on Alpine cols. Re your post of 11 Feb. I have exactly the same problem with the brake staying on. Is it not easier to clean around the return spring inside the hub? Hey, I tried that once or twice, but it’s a bit tedious. I think it depends how fast you’re gunking it up. Sticking a spring on had the same effect and only took a couple of minutes! Hi Dave, Where did you put the external compression spring on the reaction arm? Picture?